With a powerful V6 engine, comfortable interior and a wide range of standard features, the 2017 Santa Fe is an example of an excellent SUV for the quality-minded purchaser. An attractive interior and a number of incremental improvements from earlier models help turn the Santa Fe into a very useful 3-row SUV for professional and personal use alike. The base model and SE Ultimate trim can seat up to seven individuals in three rows, while the Limited and Limited Ultimate can seat six passengers. The first two rows of seating have been praised by reviewers for providing excellent comfort and a very roomy feel for their occupants. Both rows are adjustable, making them quite comfortable for long drives, with abundant legroom for even the largest adult. Unfortunately, reviewers have generally found the third-row seating in the 2017 model to be cramped and unsuited to long-term occupancy by anyone larger than a child or small adult. 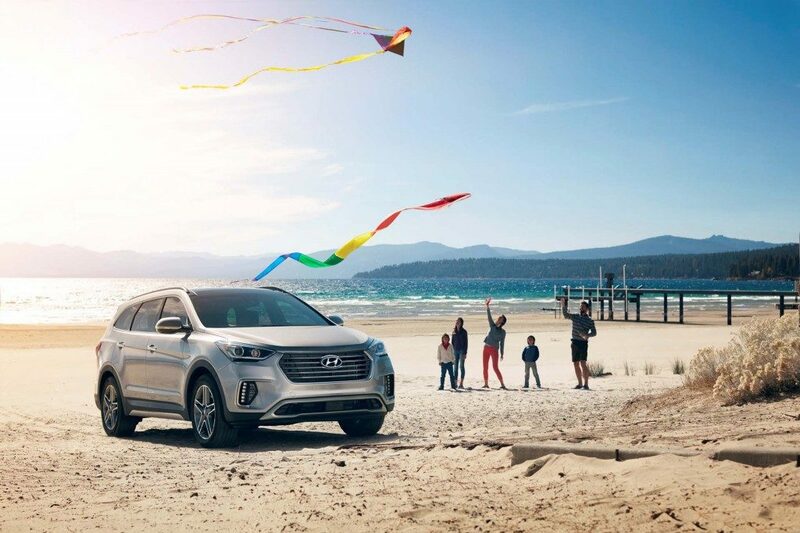 For this reason, potential buyers who expect to be using their SUV to transport adults or larger children should consider one of the Santa Fe’s larger competitors. While the 2017 version does not represent a fundamental break with earlier models, a number of highly useful improvements have been added to this year’s model. New LED running lights, a standard 7-inch touchscreen and improved safety features mark a series of incremental improvements when compared to earlier Hyundai models. In addition, the 2017 model enjoys an improved vibration and sound dampening design which effectively isolates the passenger compartment from most outside noises. All in all, individuals upgrading from previous model years will notice a distinct improvement in the 2017 model’s comfort and driving experience. While not opulent, the interior is comfortable and quiet. Stain-resistant upholstery comes standard with the vehicle, making it an excellent choice for pet owners and parents alike, as most spilled food and other accidents can be quickly dealt with. Heated rear seats, ventilated front seats and a heated steering wheel are also available, as are heated front seats in all models but the base. However, it has a reduced cargo capacity when compared to other SUVs in its class. With all seats in use, it can store up to 13.5 cubic feet of cargo behind the third-row seats, with that capacity expanding to 41 cubic feet with the third-row seating folded down, to a maximum of 80 cubic feet of cargo with the second-row seats folded down. An available hands-free liftgate makes stowing cargo quite simple, an important point for older purchasers or families with children. The 3.3-liter V6 provides enough power to get it where it’s going, while a standard six-speed automatic transmission ensures that the SUV is always responsive to its driver’s needs. The engine provides the SUV with enough power to tow loads of up to 5,000 pounds without dramatically harming the driving experience. The fuel economy is competitive with similar SUVs, with fueleconomy.gov rating the FWD Santa Fe at 18/25 mpg for city/highway driving. The AWD model is slightly less efficient when it comes to fuel economy, coming in at 18/24 mpg for city/highway driving. The 2017 Santa Fe is not a high-performance vehicle. Instead, it focuses on providing the driver with a smooth, comfortable driving experience, both within the city and on the highway. The improved suspension provides a quiet and comfortable ride, damping out jolts and letting the driver focus on driving the SUV. The optional all-wheel drive (AWD) option provides better maneuverability, especially on rough or unimproved roads, and should be picked up by drivers who live in rural areas or who expect to be doing a lot of driving during inclement weather. It comes with a range of standard and available safety systems and has received top ratings from both federal and private testing agencies. In fact, the IIHS has awarded the vehicle its top safety rating, certifying it as one of the safest 2017 SUVs on the road. All models include standard automatic headlights and rearview camera, while a 360-degree camera system is also available, further improving the driver’s awareness. However, some reviewers found that the back windows were smaller than would be ideal for the driver’s visibility. Other available features include lane change assist, rear park assist, cross traffic alert, lane departure warning, blind spot monitoring and automatic emergency braking combined with a pedestrian detection system. With the SE trim level costing $30,800, most buyers will find the it very affordable. The Limited starts at $34,950 and seats six individuals, while the SE Ultimate seats seven individuals for $38,700. The Limited Ultimate trim comes in at the top of the line, seating six and costing $39,400. All models can have AWD added for an additional $1,750. SE comes with Bluetooth, six-speaker sound system, HD radio, Apple CarPlay, 7-inch display, as well as Hyundai’s proprietary Blue Link system, which connects smartphones, android devices and Apple Watch to the vehicle. For an extra $3,650, the SE trim can be upgraded to the premium package, adding leather upholstery, blind spot monitoring, lane change assist and a hands-free automatic liftgate. Limited adds blind spot detection, rear cross traffic alert, LED fog lights, third-row USB port, lane change assist, push-button start, auto open liftgate, and heated front seats. SE Ultimate adds a panoramic sunroof, heated second-row seats, ventilated front seats, 12-speaker Infinity audio system, rear park assist, and a multi-angle camera. For $2,100, the Tech package adds adaptive cruise control, automatic high beams, and a lane departure warning system. Limited Ultimate is the best trim offered, with seats for six, premium exterior door trim, and silver painted accents. This model can also be upgraded with the Tech package for $2,100. The Santa Fe provides an excellent ride, with competitive fuel economy when compared to other SUVs. In addition, its high safety ratings make this an excellent choice for families with children. While the cramped third-row seating does make it less ideal when transporting a full load of adults, it remains one of the standout SUVs. Thinking of buying a Santa Fe? Already own one? Leave a comment and let us know what you think!